When I visited the Ashram at Brindavan, Whitefield, near Bangalore in India, I attended morning darshan. This was the year 1993. Swami walked amongst us and as He passed by me, He suddenly stopped and asked me, “Where are you from?” I felt very nervous and not really used to the protocol within the ashram – I answered, “Australia, sir.” He then asked me rather sternly, “Are you with a group?” which sent me into complete confusion and I replied, “No.” I was thinking but you know I am alone, you called me. It was only then that the ladies around me excitedly explained that I had been called for an interview and that I should go to the verandah of his house, where there were 19 others waiting. He then turned back to me, with a smile and said, “And what is your name, Val?” At which, everyone laughed. He then called me to him and I sat at His feet. He then manifested a beautiful green ring and placed it on my marriage finger. I still couldn’t speak, but I was laughing and crying all at the same time. He heard my thoughts about ‘my marriage finger’ and removed the ring putting it onto the fourth finger of my other hand. I wanted to give Him something, but the only thing I had with me were some wilted jasmine flowers in my hair. I tried to give them to Him but He laughed, stopping me and said, “I don’t need your flowers I have the flower of your heart.” which made me weep with joy even more. I still hadn’t said anything. He showed me later in meditation that I had been married to God in many previous lives. He asked me, “Where is husband?” lifting my hand and arm up like a prize fighter; saying to everyone present, “Husband is Banker.” Everyone laughed, but I was stunned and still speechless, for a few years earlier, I had been awakened by a Light Being presenting himself as “White Eagle” and asked if he could speak to my husband John. Using my voice box, John was asked if he would be their banker? We are still not sure what that is about. When Baba had given me the ring, He said, “When you look into the ring, I will be there.” I know now, that He was putting me to work. When I returned home, I was often awakened at night and trained to accept a Light Being to move into my body and speak through it. My voice changes. With more training, and service, the years have passed. Two books have been written, The Book of Love by a Medium, which Sai Baba sat with the manuscript on his lap and personally blessed it saying, “God is love, walk with God.” The next book, Alcheringa, When the First Ancestors were Created, Sai Baba said with a big grin, “Ah! The Booku” and also personally blessed that manuscript. It is only two years ago I returned to India for the 8th time to attend a conference on Regression and Past Life Therapy. It was attended by people from around the world. Some visited the Naadi Palm Leaf readers. Normally I would not have a reading for I am blessed with good telepathic connection to Light Beings from other worlds, who teach me. Sai Baba telepathically advised He would like me to attend a reading and that He would send me a message through the palm leaves. The reader said, “You have three Gods in your thumbprint,” and proceeded to record a reading. The reader said, “You are a twin.” I interrupted and said, “No, I’m not a twin” The reader ignored me and repeated, “You are a twin” and then proceeded. In a way I am a twin for I have had a near death experience and at that time the soul of my body left and was replaced with another soul. I still thought when the reading was taking place that he had the wrong leaf. It was only after I had heard a voice saying to me, “It was time” – this is 2 years later, that I was prompted to re-listen to the reading, with the help of another medium friend of mine. 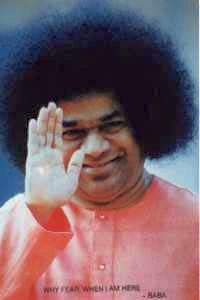 I had been told, in the reading, that I was to be used by the Lord Sri Sathya Sai Baba as an instrument when I was 75 years old, and that as I became older I would advance into a full trance medium – not remembering anything – and this would continue from time to time, until I left my body. 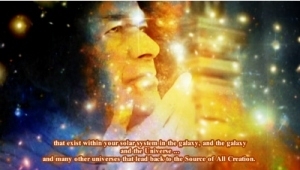 My work has truly begun for The Lord Sri Sathya Sai Baba to use me as an instrument, so that He may present Himself as The Cosmic Sai Baba.